Comedies don’t need to be plausible to be successful. Oftentimes, in fact, the more far-fetched, the better. But in the case of a preposterous comedy, a playwright must make a bargain with the audience: Suspend your disbelief, the writer suggests, and I’ll leave you in stitches. Whirlwind presents such a wager to audiences, but it doesn’t make good on it. Here, believability and hilarity are in equally short supply. Ultimately, a show that promises to be a boisterous maelstrom instead merely kicks up dust. The story begins in the office of Arrow Energy, a wind-power company in San Francisco, where Bethany (Annapurna Sriram), the company’s health and safety manager, finds herself relying on self-help podcasts to deal with her lecherous and obnoxious boss, Cooper (Johnny Wu), the kind of “green” corporate bigwig who spins tales about helicopter skiing at Davos. Gabriel Firestone’s minimalist set design—most notable for its verdant rectangular window—nicely establishes a slick, corporate aesthetic that lands somewhere between an Apple store and a hospital waiting room. Cooper is a #MeToo nightmare, and Wu gives his sliminess an almost tactile quality. But Bethany seems intent on weathering the storm and climbing the corporate ladder, and so she agrees to take the reins when the nerdy ornithologist Michael (Christian Conn) shows up in the company lobby with a bone to pick, just as Cooper leaves town for business. Some of Arrow’s wind turbines, Michael claims, are killing endangered birds. Either move the turbines, he tells Bethany, or he’ll go to the press and the authorities. Asking Arrow politely to comply with regulation doesn’t make much sense. But it conveniently allows Michael to come into contact with Bethany and ignite a nascent romance. Michael and Bethany don’t make much sense, either, though. Michael is a passionate activist, while Bethany seems intent on toeing the company line. She’s smarmy, he’s sincere. Ultimately, they’re too obviously mismatched in both temperament and politics to plausibly be into each other, but at the same time not obviously mismatched enough to bear comedic fruit. As a result, their dynamic is just plain uncanny, despite Conn and Sriram’s best efforts to synthesize some genuine chemistry under Dan Amboyer’s direction. Nevertheless, their romance gains momentum as, miraculously, they agree to continue discussing their irreconcilable differences over dinner and a late-night birdwatching session. David Sexton’s magical lighting and Matthew Fischer’s serene sound design set the scene for an unlikely hook-up, and the lovebirds dutifully play their part. Their rendezvous, naturally, muddies the showdown over the turbines, which grows only more heated when Cooper re-enters the picture, arms swinging. Lurking beneath the surface of the two men’s political maneuvering is competition over Bethany, which pushes them toward a climactic, violent ending. Whirlwind’s satirical conceit rests on this bad behavior. The target is the disconnect between modern environmentalism’s progressive goals and some of its practitioners’ dubious motivations—profit, personal ambition, and sexual conquest. It’s a legitimate, if somewhat feeble, critique. 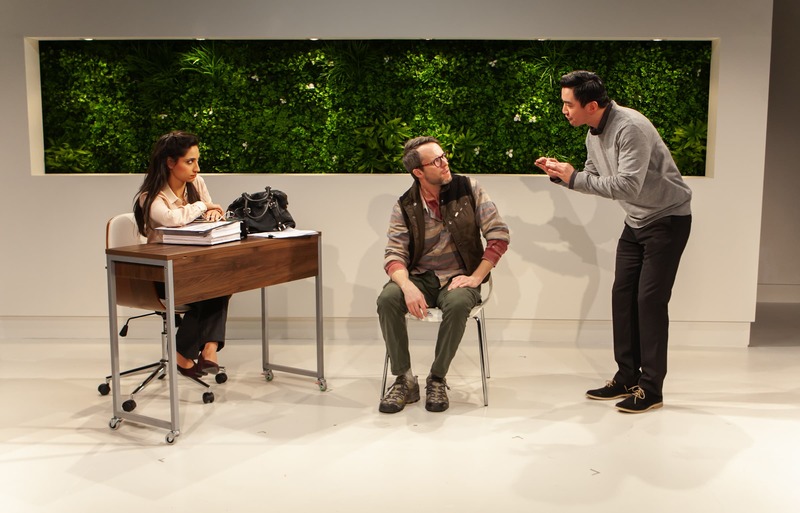 The play’s central political conflict, however, rests on shakier ground. While Whirlwind strives to create complexity by situating the fanaticism of birders and wind advocates on level ground, the sense of equal wrongdoing in this case just doesn’t add up. Illicit affairs, ecoterrorism, workplace harassment—Whirlwind is a whirlwind indeed. But the narrative payoffs are too few, and the political conclusions too glib, to justify all the tumult.